So, I've been eating mostly primal/paleo for well over a year. My kids eat mostly what they want but I do try to give them real food rather than packaged or processed junk. If they want toast or pizza on occasion, that's what they eat. But they do know that I don't eat things like that and they do know what foods are healthiest for them. They ask me sometimes why I "can't" eat pizza with them; I say " I can eat anything I want, but I choose to eat this rather than that." Well, a little while back, the Girl told me they were learning about nutrition at school. Uh oh. She was bringing home worksheets about what foods were healthy and what foods were not. Now for the most part the choices were ok; Like choose an apple rather a bag of potato chips. But there were a few things on there that they considered healthy that I didn't. 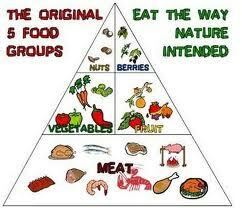 And of course there was the omnipresent Food Pyramid. One day the girl brought home some homework in which they asked her questions about said Food Pyramid. She came to me a bit upset and said "They want me to answer this question by saying we're supposed to eat a bunch of servings of bread and grains every day, but that's not what you say we're supposed to do. So I don't know how to answer it." I wasn't really sure what to say to her...I want her to understand what foods really fuel her body, but I also want her to do well in school. So I said "Go ahead and tell them what they want to hear, but know that you might know more about this than they do." In the end, she wrote the answer they were looking for, but wrote a little qualifier next to it telling them she was telling them what they wanted to hear, but she didn't think that was the right answer. I thought that was a great way to do it! How do you and your kids deal with authority figures spouting "conventional wisdom" as if it's the only truth?